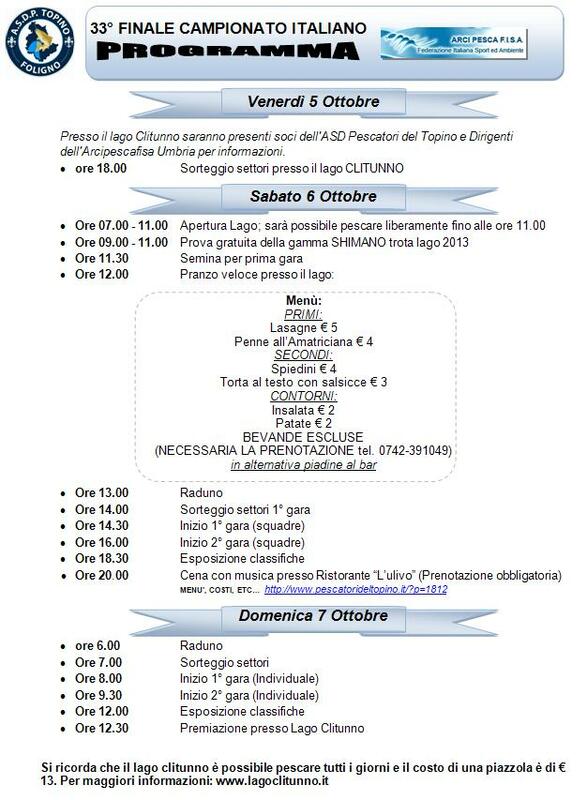 In the days of Saturday, October 6th and Sunday, October 7th, 2012 the Lake Clitunno will host the Finals of the Italian A.R.C.I. Pesca F.I.S.A. Lake Trout Championship, individual and team. The Lake Clitunno, located in Casco dell'Acqua, Trevi, and fed by the waters of the homonymous river, covers an area of about 10.000 square meters, with an average depth of 3 meters. Last year at Lake Sant'Anna in Pieve Vergonte, Verbania (Piedmont), triumphed in the individual Dante Boiardi of the A.S.D. Arcobaleno, while in the team category the A.S.D. Campi Bisenzio Stonfo Tubertini. The 2012 Italian Lake Trout Championship Final continued to exert the regulation: two races (and two rankings, editor's note), which in turn are divided into two sub-events. The final classification of each race will be based on the sum of the penalties and the number of fish caught. The first race to be started, after the draw for the areas Friday, October 5th, 2012 at 18:00 and a free trial of the 2012 Shimano Lake Trout range Saturday, October 5th, 2012 from 09:00 to 11:00, will be the team's one, from 14:30 of October 6th. The individual competition will take place instead on Sunday, October 7th, 2012 starting at 08:00. The award ceremony will take place at the lake on October 6th, at 12:30. The Finals of the 2012 Italian Lake Trout Championship will be more than just competitions. In fact, starting at 20:00 on Saturday, October 6th, 2012 and at "L'ulivo" restaurant in Matigge di Trevi, there will be “La Grande Notte della Trota” ("The Great Night of the Trout"), with traditional dishes and music. Reservations required. 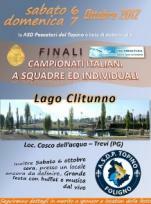 Programme of the 33rd Italian Championship Lake Trout attached. For more information and reservations for "The Great Night of the Trout", visit the official website of the “A.S.D. Pescatori del Topino” of Foligno pescatorideltopino.it.